So nice to actually be starting this thread in February! The 2017-2018 season was so incredible, to put it in Phillie Phans perspective, imagine if the '93 Phillies won the World Series, that's how improbable the Eagles season was. As Super Bowl champions, the Eagles will open the season on Thursday night at home. So the Eagles lose QB coach and Wentz Whisperer John DeFilippo as he takes a job to be the Viking OC. Eagles OC Frank Reich is interviewing for the Colts head coach opening. Doug Pederson calls the plays, but losing DeFilippo and Reich would be a huge loss. Hopefully the Colts go elsewhere to find their head coach. DC Schwartz appears to be staying, so that side of the ball should stay intact. We'll have to see if any of the other position coaches get poached or let go, there are always some changes every year, but it is hard to see when a championship team goes through changes. QB Nick Foles: They can keep him, which there is a valid argument in favor of doing so, Wentz may be ready for the regular season, but if not, Foles would be a solid insurance policy. The combined salary of Wentz and Foles is less than most starting starting QBs in the league. They can also trade him, as his value will never be higher and the Eagles don't have 2nd or 3rd round picks next year. If a deal comes along that nets the Eagles something like a mid 2nd rounder and a player for Foles, you'd have to consider it. OL Jason Peters: Peters has stated he is coming back and Pederson has said he will be the starting LT, which means Vaitai will go back to being a sub. RB Darren Sproles: Sproles is a free agent, but after saying 2017 would likely be his final season, he has said he wants to come back. If he is healthy and willing to take a smaller contract, he would be an upgrade over Barner (who is also a free agent). Interesting decisions to be made, Sproles, Burton, Bradham, Blount, Robinson, Allen are going to be the hardest decisions. The 2018 salary cap has not been announced, but it is estimated to be around $178 million. The Eagles have $186.4 million in active contracts on the books for the top-51 players on their 2018 roster. Howie has his work cut out for him. March 14 - First day of the NFL league year. The schedule you get really is something. All five playoff teams and the other AFC finalist. Remember when everyone was talking about which back-up they would have to get to replace Foles for early in the season (or even as Sudfield insurance)? I do think Foles stays. Just seems like there are too many QBs out there for the Eagles to get blown away by an offer. All with questions, but he's still got them too. Though, I wonder what the Vikings would give for him. I think I don't bring back Sproles. Clement fills that role nicely and, quite frankly Smallwood may as well. I have mixed feelings on Blount, but if I have to let him go so be it. If Peters comes back, has to be on a reworked contract. He's another year older and coming off of injury. Robinson can probably be let go as Elliot instead of Sturgis is hardly a drop off. I hate to see Celek leave he's also a good blocking TE, but I think Burton may - MAY - be a higher priority. I have mixed feelings, most of which are emotional. 2018 Celek = 2005 Pat Burrell. Press Taylor probably steps in as the new QB Coach. If Reich goes, a new OC will be needed. I think the only guy to bring back from that list, for the likely $, is Bradham and he may price himself out of the picture. How much cap space can we save on Peters? How likely is he to come back from injury as a plus starter? Vaitai might do a better job. I'd bring back more if we had cap space, but we don't. I'd also move Foles for a good offer. I doubt we get to keep him beyond next year, in any case. Yeah, Foles is the tricky one. X + Foles' replacement is that worth more then Foles alone, where "X" = draft pick(s)/players? I don't think you can answer that now w/o knowing the value of those draft pick(s)/players. I think Foles will make 7.6 mil in 2018, Maybe you could trade him to the Bills (who have 2 1st and 2 2nd round picks) for a 2nd (the Rams pick) and Shady and let Blount go. McLane says Taylor will become WR coach, Groh will become QB coach. He also implies DeFillippo was leaving regardless since his deal was up and the Eagles didn't let him interview for the Jets OC job last year. Perhaps that could have changed if the Eagles own OC job had been available. As hands-on as Pederson is it doesn't seem like too big a deal though. DeFilippo, who joined the Eagles in the 2016 offseason, will replace former Eagles' offensive coordinator and new Giants head coach Pat Shurmur in Minnesota. Reports are the Colts are leaning towards Reich to be their next head coach. I think it makes sense to deal Foles IF you think Sudfeld is decent back up. The odds of Wentz going down AND lightning striking twice with Foles next year are pretty low, and Foles’ contract is up next year. If Sudfeld is solid, they’ll be fine for the first few weeks if Wentz is late coming back. We need the pick so we can draft an OT and a LB high. And we badly need the cap space. Plus it will be expensive to keep Foles here beyond next season. The loss of our OC and QB coaches is a bigger issue to me. It would worry me more if Pederson wasn't the offensive guy. It's unfortunate it played out the way it did but they will find an OC. Reuben Frank at NBC doesn't think any team is going to give up much for Foles unless he agrees to an extension. And he thinks Duce should get the OC job (and would have no problem handling the passing game). Ravens and Bears will play in Thursday night Hall of Fame game in August. But, in accordance with recent NFL tradition, won't the Eagles likely play in the league season opener on that Thursday night after Labor Day? Most likely, per wikipedia, at home. A big shindig with a festival and parkway elsewhere in town. I guess we can expect the Ben Franklin Parkway to be closed that day. Yeah, and probably against the Vikings? 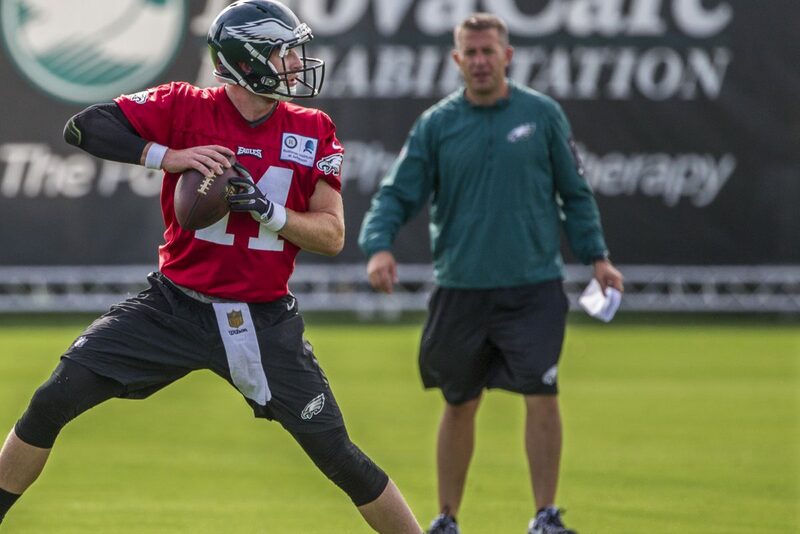 Carson Wentz says his goal is to be ready for Week 1, but Dr. John Kelly isn't so optimistic. Doug picked WR coach Mike Groh to be the new Offensive Coordinator. Don't know if that means Duce will leave but it seems like a possibility. This is from two weeks before the super bowl, but I agree, it is worrisome. Less so with Foles under contract, though. I've been to Dr. Kelly and have taken my son to him. I'd believe what he says. The hopeful part is that he hasn't seen Carson's data, so he's generalizing. We need to offer Duce a consolation prize--hefty raise or empty title or both.